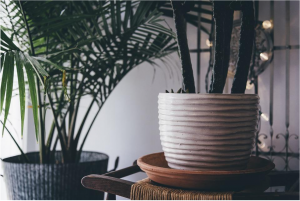 Especially if you’re new to owning and caring for indoor plants, opt for a hardier variety that will do alright with a bit of neglect. Here’s a list of 20 indoor houseplants you can’t kill, including the aptly-named cast-iron plant, spider plants, and one of our favourites: aloe. Trendy and beautiful, succulents are a great choice for indoor plants. They can be a little trickier to care for, so check out this list of the best succulents and how to care for them. Aloe is hugely popular for a reason. This all-star plant is great to have around with its many benefits, including treating kitchen burns, cuts, and dry skin. Aloe is included on the list of hardy plants and is quite easy to care for. Plus, it can help clean the air of the pollutants found in chemical cleaning products. Too much green? Try a “peacock plant” for a beautiful show of purple, green, and red leaves, or a kalanchoe succulent for its pretty pink flowers. You also can’t go wrong with a classic orchid – they’re beautiful and elegant, and surprisingly easy to care for. Some plants are especially soothing to look at. If you keep skipping your yoga class or downloaded a meditation app that never gets any use, introduce some calming, stress-reducing plants instead. We love the low-maintenance “mother-in-law’s tongue” (aka a snake plant) or a traditional bamboo palm plant. If your plant comes with care directions, read them! Not all plants are alike in terms of the water, sun, and other care they require. Read up on soil quality, direct vs. indirect sunlight, and the handy ice cube trick that you’ll be glad you learned. Plants are beautiful, fresh, purifying, and relatively inexpensive to add to your new home décor. We’re certainly big fans. Which are your favourites?